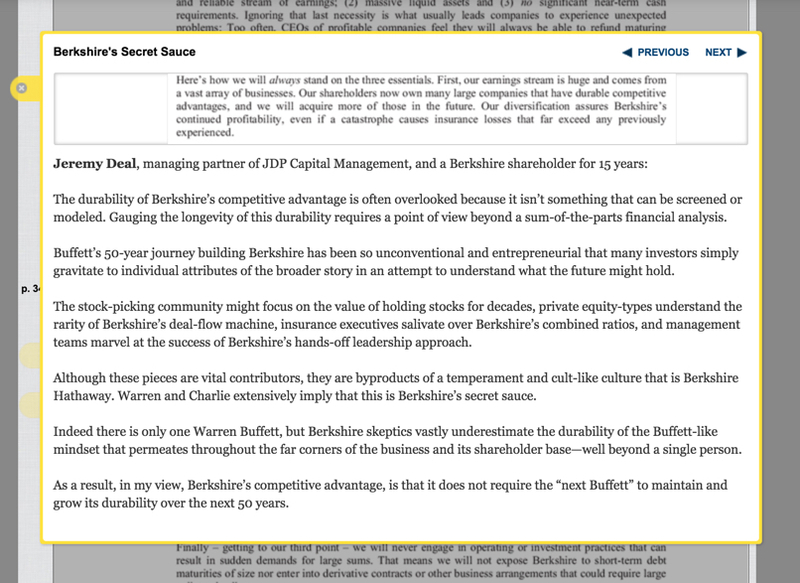 Jeremy Deal comments on Warren Buffett’s 50th annual letter to Berkshire Hathaway shareholders. The durability of Berkshire’s competitive advantage is often overlooked because it isn’t something that can be screened or modeled. Gauging the longevity of this durability requires a point of view beyond a sum-of-the-parts financial analysis. Buffett’s 50-year journey building Berkshire has been so unconventional and entrepreneurial that many investors simply gravitate to individual attributes of the broader story in an attempt to understand what the future might hold. The stock-picking community might focus on the value of holding stocks for decades, private equity-types understand the rarity of Berkshire’s deal-flow machine, insurance executives salivate over Berkshire’s combined ratios, and management teams marvel at the success of Berkshire’s hands-off leadership approach. Although these pieces are vital contributors, they are byproducts of a temperament and cult-like culture that is Berkshire Hathaway. Warren and Charlie extensively imply that this is Berkshire’s secret sauce. Indeed there is only one Warren Buffett, but Berkshire skeptics vastly underestimate the durability of the Buffett-like mindset that permeates throughout the far corners of the business and its shareholder base—well beyond a single person. As a result, in my view, Berkshire’s competitive advantage, is that it does not require the “next Buffett” to maintain and grow its durability over the next 50 years.